The grand opening on Saturday November 1, 2014 was fantastic. An estimated 450 - 500 people visited the Earlysville Exchange. A total of 209 made purchases totaling $4,691. A separate summary was written about the Grand Opening. It appeared in the Chestnut Grove Baptist Church November 5 Wednesday Word. Wednesday 5th - During the afternoon shift, I saw many of the people who came to the grand opening, return on Wednesday. This was our first day open since the grand opening. They were surprised to find new items available for purchase. Comments like, I wanted to come back and shop when I could take my time and have more room. You sure have this place looking nice. We are so happy you are here. It is about time someone opened this store. You have great prices, I would have paid $90.00 for that item and you sold it for $20.00. Question, where does the money go? Who's business is this? How many employees do you have? Where do you get all your stuff? Friday 7th - There are some making the Exchange a regular daily stop. The receiving room is crowded with donations by the time I arrived for the afternoon shift. The volunteers were excited about an antique piece that had been donated. It is thought to be from the early 1900's. They just don't make them like that today. The large three piece mirror folds, rollers are in the legs and it is full of rounded curves and grooves and this piece probably sold for $975 new and we have it priced for $50. It is a true antique. We have a large modern piece that cost close to $3,000 new that we have priced for $675. Working the cash register, I get to see everything that sells. We have some excellent prices. Most shirts and blouses sell for $3.75, sweaters for $5.00, dresses for $6.00, and coats for $8.00. I tell people, we want to see everyone enter with a smile and leave happy. Wednesday 12th - Everyone is surprised that the Earlysville Exchange is sponsored by Chestnut Grove Baptist Church. When explained that we are non-profit and all profits over cost go back to the community, they are totally delighted and some are eager to donate product. The Food Pantry and the Earlysville Volunteer Fire Company seem to resignate the most. Some leave cash donations. When our purpose is explained, you can see their puzzled look change to a smile, they relax and say something like, what a wonderful idea or I will be back. Friday 14th - Today, a teenage girl came in the Exchange with a grown up that is interested in her. You might as well say, the girl has no family. They shopped for a while and brought the items to the register. We were happy to do a no sale. The adult lady left us a donation of $100 and said thank you. I talked with the young lady later about school. This is a young lady succeeding in school despite everything. When she graduates from high school, she will have two years of college credit at a community college. She wants to go to Old Miss. Sharon was there whose daughter goes to Old Miss and they talked. It was great to see the young lady happy and smiling and proud of her accomplishments. It felt good to be part of something that could help someone and help make a difference. 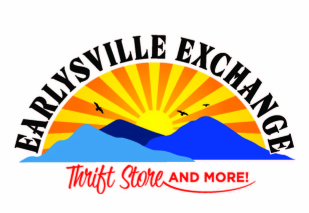 Saturday 15th - I stopped by the Earlysville Exchange this afternoon. As usual, ended up helping a few people. One was to help unload a loaded down pick up truck with donations. A lady from the Senior Center stopped by. We had talked on a previous occasion. She wanted material to post at the Senior Center. The more she understands our motives of the Exchange, the more excited she gets. Today, I was telling her about the Community Room and how we will be assisting those that need help applying online for job applications. She commented on our pricing and how low it is. I explained, we are here for the community. We are non-profit, any income over expenses will go back to the community to the food pantry, the Earlysville Volunteer Fire Company, after school program, etc. So when we sell an item at a low price, we are helping community also. Since everything is win win for the community, we have no reason to be selfish. When we sell cheap, it benefits community, when we make a profit, it benefits community. We can't go wrong. She mentioned how helpful and friendly our helpers on the floor where when she was here shopping last week. I then introduced her to Benny, the person with the vision for the Earlysville Exchange and a minister who has started eleven churches. I am looking forward to her next visit. She is a lovely lady. I left for another project, taking a box of clothing to a ladies car. Then we did the door prize drawing for the week and Benny ask me to call. I have never heard anyone so excited over a $10.00 store voucher. Remember, I was just dropping by. I stopped by the Exchange this morning. Benny showed me an envelope of 50 $25.00 each gift cards to Food Lion for the Buck Mountain Food Pantry in Earlysville to give with Thanksgiving baskets. Thanks to donors, volunteers and purchasers, this is $1,250 of food. A little later a gentleman from the Food Pantry stopped by and picked them up. Thanks to the Earlysville Exchange, 50 families in need will have plenty to eat this Thanksgiving. During my afternoon shift, a couple ask the question, Where does the money go? I explained we are sponsored by Chestnut Grove Baptist Church, all labor is volunteer, any income over expense goes back to the community. That brought another question, why do you price so cheap? I explained that when people get good product for a good price, that helps community too. So either way, the community benefits and we feel good. This question keeps coming up. People are not accustomed to someone doing something for no personal gain. To them, it is like a new concept. We need to keep explaining. Friday, Nov. 21 - This morning, we were notified of a family in Madison getting burned out last night. They were invited to shop for immediate clothing needs at the Earlysville Exchange. They picked out close to $100.00 value of items. Thank you Earlysville community and volunteers for making this gift possible. This afternoon during my shift at the register, my friend returned. We talked and then she shopped, we talked and then she shopped. She kept adding to her selected items stack. She had a good shopping day. Shortly before closing, a lady came in and fell in love with a gas fireplace with mantel we had recently received at the Exchange. She and her husband are building a new living room in their home in Earlysville. She said, we need that fireplace, I am in love with that fireplace. I need my husband to see that fireplace. Lady and husband returned and purchased the $350.00 like new fireplace that most said would sell for about $2,000. They went home a very happy couple. We keep meeting wonderful people at the Earlysville Exchange. Saturday Nov. 22 - I stopped by to give Bob a break on the cash register. A lady and her son came in and after they finished shopping, we got to sit down for a while in the coffee area. We had a great conversation about the Exchange, her sons and early life in Earlysville. Friday, November 28 - This is Black Friday. There was some discussion about not opening on Black Friday since all the stores are running specials. We would have been completely wrong. We had the best Friday in our short history. Sales were $1,526 for the day. There was a steady flow all day long. I was working the 2:00 to 6:30 shift. Several people like Edith Fisher and Kathy Osvath had put up Christmas displays and Tonya King made decorations for the two large front windows. Earlysville people got good product at a great price and some funds were raised for the community. Another win win day at the Earlysville Exchange. I have noticed we have some people who stop by every day we are open to see what is new on the hangers and shelves.